Last weekend my daughter and I went out for a hike along a lazy little stream called Minnehaha Creek that makes its way down to the Mississippi. We went the back way down a well worn trail through the woods, joking about ghosts and monsters that might be lurking near the giant old weeping willow tree. 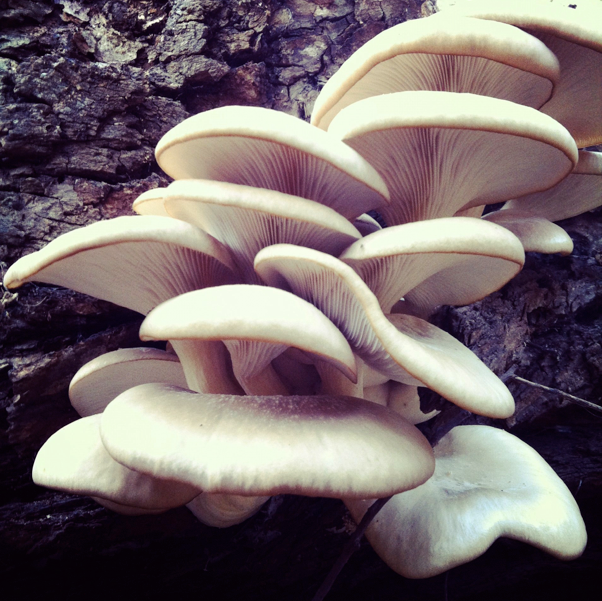 As we walked under the willow, fighting a magical battle with our stick swords, I spied two large clumps of mushrooms. Lovely, pale silvery brown, some as large as my hand, the mushrooms fanned out in a layered array from the side of a downed ash tree. Stick swords abandoned, we went to investigate. Edible? Oh please, say yes. Thus began my first encounter with wild mushroom hunting in Minnesota. Luckily, I know a few folks with some experience, including Kathy from Kathy’s Foray and my neighbor, Steve. 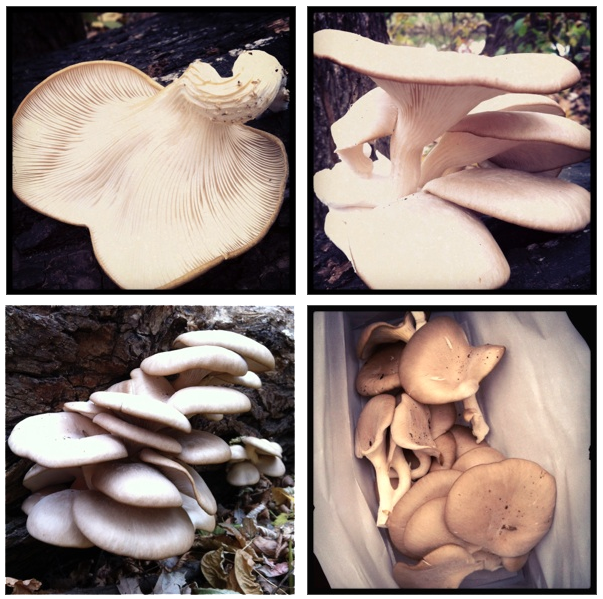 I tweeted Ms. Kathy and she thought they might be wild oyster mushrooms, but suggested I pick some to examine further. Steve had never foraged oysters specifically, but had the Audubon mushroom field guide, as well as some black paper for a spore print. The next morning I made myself the breakfast of champions: Wild oyster mushrooms sautéed with shallots, green onions, butter, salt and pepper, then scrambled with eggs. I think I died and went directly to heaven, but only because they tasted amazing, not from poisoning. And it was only Tuesday. Mince shallot, slice onion and dice mushrooms. Sauté everything on medium low heat until the mushrooms are tender, about 15 minutes. Season the mushrooms, turn the pan to low, add the egg and cook to a soft scramble. Cancel work and take a sick day because work might pale in comparison to breakfast. *PLEASE seek expert advice when identifying wild mushrooms! Get a good field guide, do the comparisons they recommend, and show your treasures to people with experience until you get the hang of it. And good hunting!